Ben Stroud claimed three wickets for Bourne against Market Deeping. 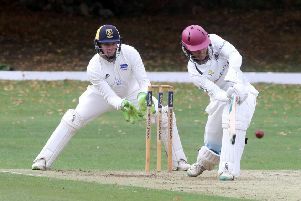 Bourne inflicted more misery on struggling neighbours Market Deeping with a 94-run win in the Lincs Premier Division derby at the Abbey Lawns today (May 13). It’s four defeats from the opening four games of the season for Deeping who are propping up the rest of the division. Faisal Javed scored 46 of Spalding's 95 at Lincoln. They had a glimmer of hope yesterday when tqo quick wickets including that of home skipper Peter Morgan left Bourne at 87-3, but half centuries for Carl Wilson (83), Jack Berry (60), Quewin O’Connor (55no) and Sam Evison (51) helped post a 50-over total of 279-6 that was always likely to be winning score. And so it proved despite the best efforts of Deeping skipper Dave Sargeant who cracked 79 and teenage opener Josh Smith who posted 32. The dismissal for a fourth-ball duck of star man Dave Gillett by Tom Dixon was the final blow. Dixon finished with 3-40 with Ben Stroud (3-66), Berry (2-31) and Colin Cheer (2-47) also chipping in with vital wickets. Spalding are keeping Deeping company at the bottom (albeit with five more bonus points) after also losing for the fourth straight match. Jonathan Miles, Hafiz Majeed and Cameron Roy all bowled tidily as Lincoln closed on 216-7, but Spalding’s reply was a one-man show as opener Faisal Javed made 46 of their 95 all out. Bourne 279-6 (C. Wilson 83, J. Berry 60, Q. O’Connor 55no, S. Evison 51, Z. Simmonds 2-63). Market Deeping 185 (D. Sargeant 79, J. Smith 32, T. Dixon 3-40, B. Stroud 3-66, J. Berry 2-31, C, Cheer 2-47). Lincoln 216-7 (W. Taylor 54, J. Miles 2-35, H. Majeed 2-43, C. Roy 2-49). Spalding 95 (F. Javed 46, J. Pateman 4-27).